The changes to the QOF detailed on this blog and the detailed calculations of losses under the proposed contract imposition are only a relatively small part of the current issues between GPs and the government. The central issue from Numbers 10's point of view appears to be extended hours. If the governments proposals are accepted then a Directed Enhanced Service will be commissioned for these extended hours. The politics are complex an I would direct the interested reader to Lawrence Buckman's letter to the profession. The fundamental drive of the DES is that there should be 30 minutes of extra time per one thousand patients on the list to be delivered in 90 blocks in the evening or weekends or 60 minutes in the mornings. We are, however on shifting sands here. 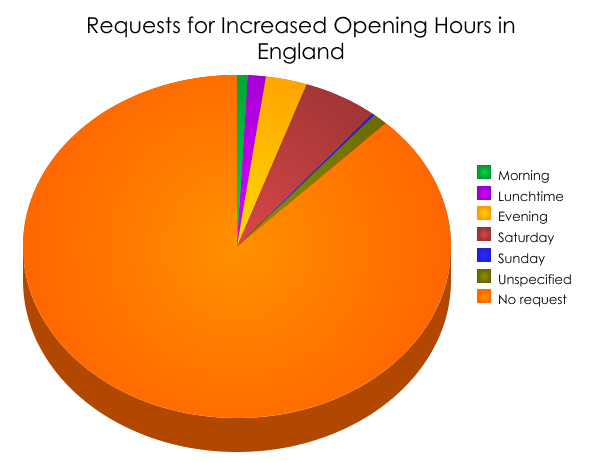 A new provision brought in at the end of January is that there should be no time when reception is closed during the core hours. Any reception close would have to be replaced with clinical time. The extended hours would be agreed with the PCT and based on the results of the GP Patient Survey, a national survey of patients about primary care. The results of the patient survey have been published and so the figures can be used to work out an estimate of the impact of the DES. What I have done on this site is to calculate the amount of time required from each practice and then allocate those hours according to the result of the survey. Thus is 51% wanted weekend access and 49% evenings and there were two sessions to allocate then there would be one to each. If there was only one it would go to the weekend. A fairly simple formula but it does make it easy to automate. The ultimate detail is in the source code. The results can be seen on the practice pages. The summary is that it is not the couple of hours a week that many imagined. 55% of practices will be required to produce three hours or over on a Saturday. Around 160 practices would also be doing Sundays under this formula. Interestingly only eight practices would be required to provide early morning surgeries. Some of the problems with the current proposals are also seen. It is widely reported that simultaneous surgeries would not be permitted (i.e. you could not supply three hours of time by two GPs working for 90 minutes simultaneously). One of the effects of this rule is that opening hours for smaller practices will be considerably less than those for larger practices. Under this rule two practices would be open from 8am on Saturday until half past midnight on Sunday morning. Clearly this is absurd. I will try to keep the model updated with changes, but there remains a lack of detail in these proposals, and much of the detail that does exist may not be that practical. Obviously if anyone from the government side of negotiations knows better then the email address is below! Allowing the government to use QOF points for non-evidence based work, essentially means we will be voting to accept a new GMS3. Will we then be placed into a position, where every year, we have to accept a GMS revision? GPs may have to consider drawing a line in the sand. Does the profession need to vote against the offer and accept the draconian imposition no matter how unpalatable it is? At least the BMA would then have the evidence that the Government was prepared to disinvest in primary care as a prelude to privatisation. Another possible aim of the Government is to break the national contract, with possibly NI, Wales and Scotland offering different terms. It will then make it difficult for GPs in these countries to support their English colleges, if their own Governments have negotiated acceptable changes. A change in Government may not herald a change in health policy direction and privatisation of primary health care may be inevitable. It may be better for the BMA to save its efforts in trying to resist this change and to start co-operating, to ensure a smooth transition and the best possible terms for GPs. Thanks for this it is very useful. Could you produce a calculation for imposition A, of the likely cost to practices? if practices have to open sequentially (rather than concurrently) for 30 minutes per 1000 patients then where will that leave Darzis 'polyclinics' with 50,000 patients?!? i dont think there are enough hours in the week for their extended hours!